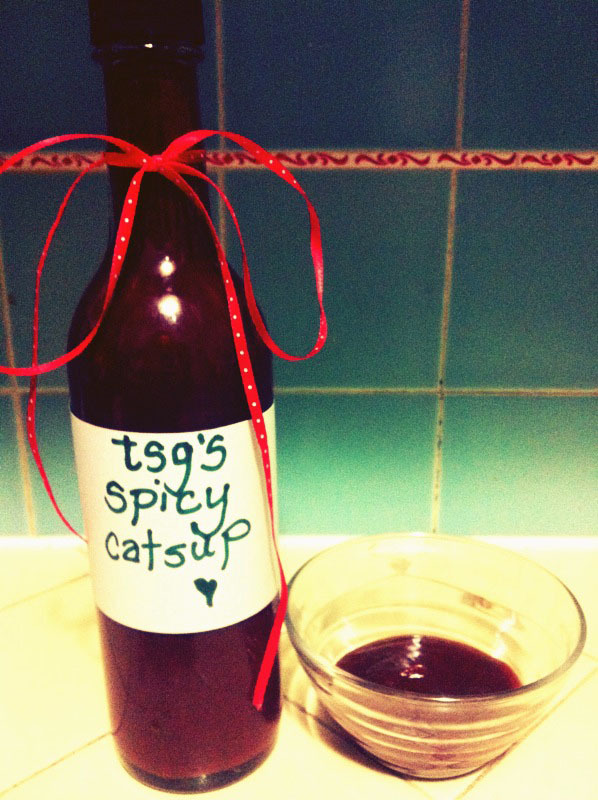 ketchup (or catsup!) is one of those things i never knew people could make from scratch. the bottle of Heinz always sat in our fridge and i took it for granted. now that i'm an adult, i know why so many kids love ketchup - it's filled with sugar. but not just just any sugar, high fructose corn syrup. high fructose corn syrup is the trans fat of sugars, no matter what their commercials say or what they name it (corn sugar?!?!?). i decided to make a ketchup that was flavorful, high fructose corn syrup free, low sugar and costs the same or less than Heinz. the recipe i produced is so delicious, and very inexpensive. i used 2 cans of tomato paste, which was the most expensive ingredient. if tomatoes are in season of course use those instead! i used tomato paste because tomatoes are not in season here, it saves a lot of time, and it's inexpensive. i added balsamic vinegar and red pepper flakes because i lovvve them. typically ketchup is made with distilled white vinegar, but i really love the flavor of balsamic and tomato. it reminds me of a caprese salad. the balsamic paired so nicely with the tomato flavor, but it made my ketchup a little dark. if you prefer a bright red picnic ketchup, use white vinegar instead. the result was much cheaper than store bough ketchup, much more delicious, and had a lot less sugar. not to mention it's customizable - you can play with the spices!! this recipe is so versatile! i added few cloves, but allspice, cinnamon, bay leaves, or star anise would be delicious. the ketchup recipe is included below. 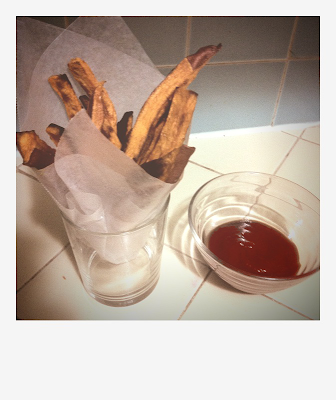 as for the sweet potato fries, i used cat cora's recipe. i didn't change the recipe at all, and the only thing i would suggest is making your fries thin matchsticks and of equal size. that's because when you are baking them the different sizes they are more and less done depending on the size. the recipe was a cinch! it was a great snack - healthy and delicious. 1 tsp red pepper flakes if you are a spice wuss, and up to 1 tbsp if you are as into heat as i am! a container to store your ketchup - an empty Heinz bottle or canning jar works well. i used an empty balsamic vinegar jar. add everything to a large pot with a lid. bring it to a boil, and when it starts bubbling put the lid on and turn down the heat to a simmer. keep it simmering for about 2 hours. fish out the cloves, if you added them. otherwise, use the funnel to pour the ketchup into a container. the containers for holding your ketchup are not sterilized, but they have a lot of acid from the tomatoes and vinegar so they will last in the refrigerator at least a few weeks, and probably longer. if you want your ketchup to last for months on a shelf, please see this link on the safety precautions to take when canning your homemade ketchup.